The only reason we started our anniversary trip in Oahu was to visit Pearl Harbor. I dig military history. Since the budget cutbacks of our government the National Parks service has shortened the number of tours that they do at Pearl Harbor, limiting the amount of people that can visit in one day, so we arrived at the harbor at 7:30 (or half an hour before they opened) and found a line almost two blocks long to get in to visit the Arizona Memorial. The last tour started at 1 PM, ours was at 12:45, so we lucked out. 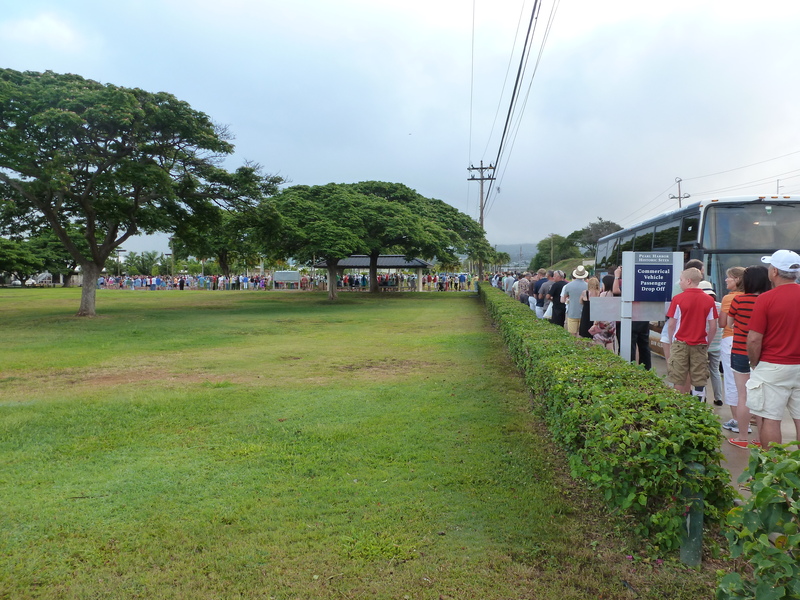 If you’re planning on visiting the Arizona Memorial please try to get your tickets reserved online prior to your visit. We tried two months in advance and couldn’t get any, but lucked out and arrived early enough to get some of the few remaining “open tickets” of the day. 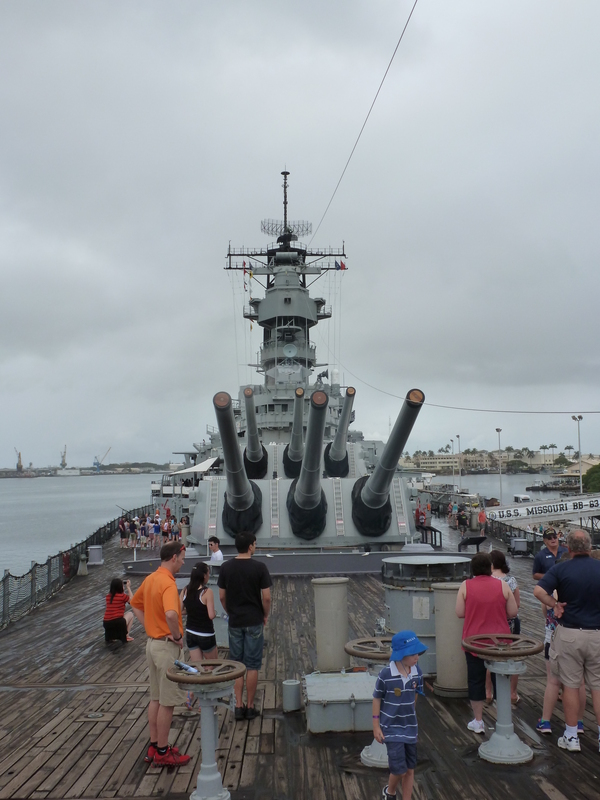 With five hours to kill we bought tickets to visit the battleship Missouri (the tickets to visit the Arizona Memorial are free). Pearl Harbor is exactly that, a harbor that holds many, many ships. They provide a free shuttle service that takes you from exhibit to exhibit. We could have also purchased tickets to visit the Bowfin (a WWII submarine) and Air Museum but opted to pass. 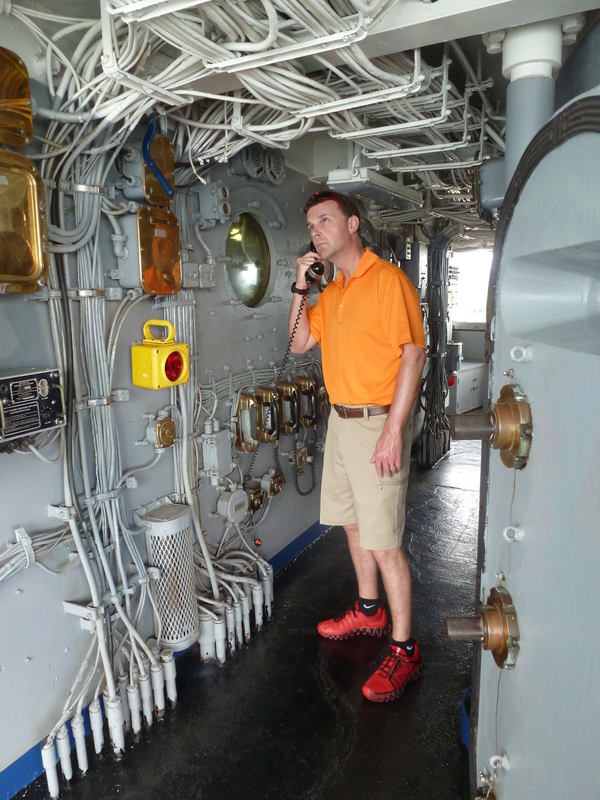 They let you walk around the ship or you can have a guided tour, we’d recommend that you do both. If you decide to do the tour, get an old guy as a guide as they’ll give you a little more colorful and first hand account of what it was like on board. We had a young man give us our tour and he did okay but it was more like he was reciting out of a history book rather than telling it from the heart. After we finished with the Missouri we grabbed some lunch at a place called Schooner’s. 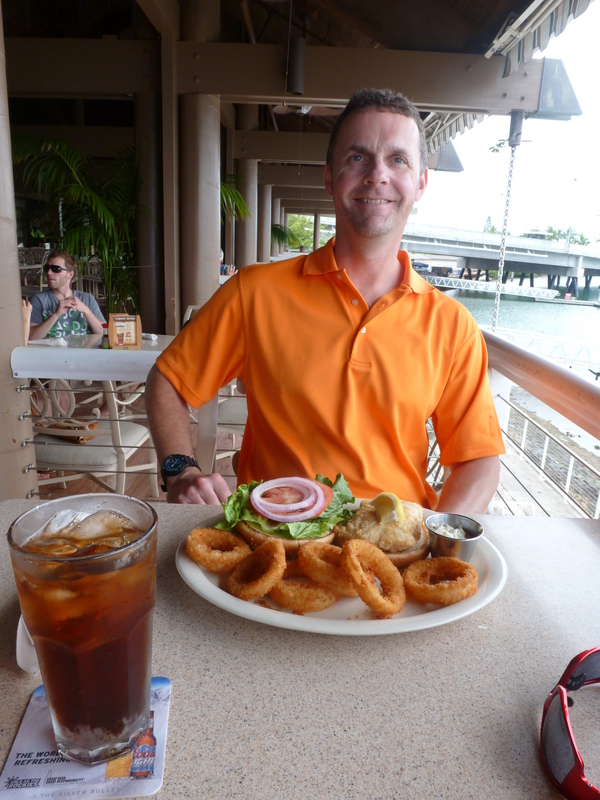 Like most of the other places that we ended up eating at, we dined with a view of the ocean, or in this case Pearl Harbor. I had the best fish sandwich ever, and we both ate fish for most of our meals…except breakfast cuz breakfast is BACON-TIME. The best fish sandwich that I’ve ever had until the following night when I had the next best fish sandwich that I’ve ever had. They take you out to the Arizona Memorial on a shuttle boat after you’ve watched a short film about the lead up to WWII. 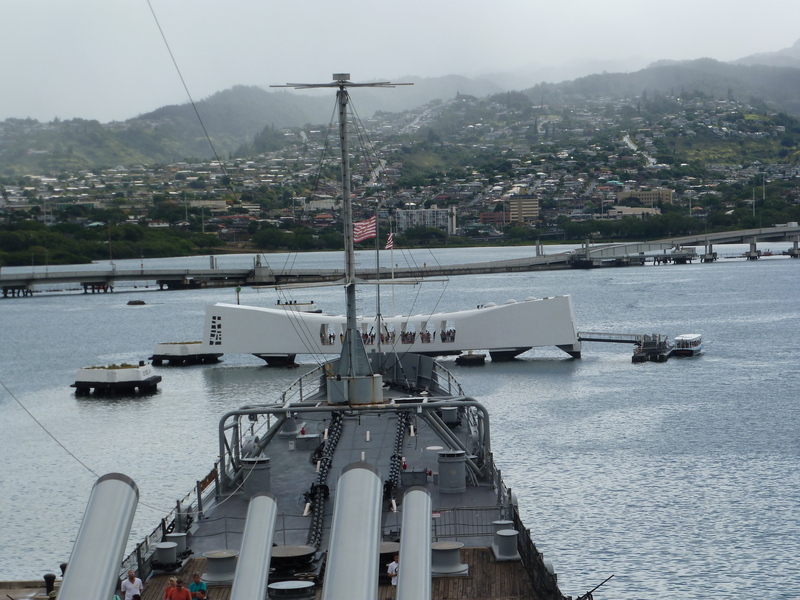 There’s several exhibits for you to look through on the grounds of Pearl Harbor that are very well done and real interesting. If going and a history nut, allow a couplea hours for that alone. I’m not attaching any photos of the Arizona Memorial as they don’t do justice. It’s a great place to visit, and if you go…take it in, in a hurry as you’re only allowed about ten minutes in the Memorial itself. They really push a bunch of folks through there in a short time. We ended up at the pool, warming ourselves in the late day sun, tired of being rolled in the surf. Folks from all over the world were doing the same all around us. In the evening we ventured out in the downtown area of Oahu, where high end stores line the streets. We found a nice place to eat called “The Yard House” where I had the best fish sandwich ever, again. Connie tried it and thought that they had added beef to the burger, but no…the fish is that good over there. Still feeling the affects of jet lag and the time difference (and the fact that the hotels fire alarm went off every twenty minutes for an hour and a half the night before starting at midnight) we turned in early, or around 2 AM Iowa time. 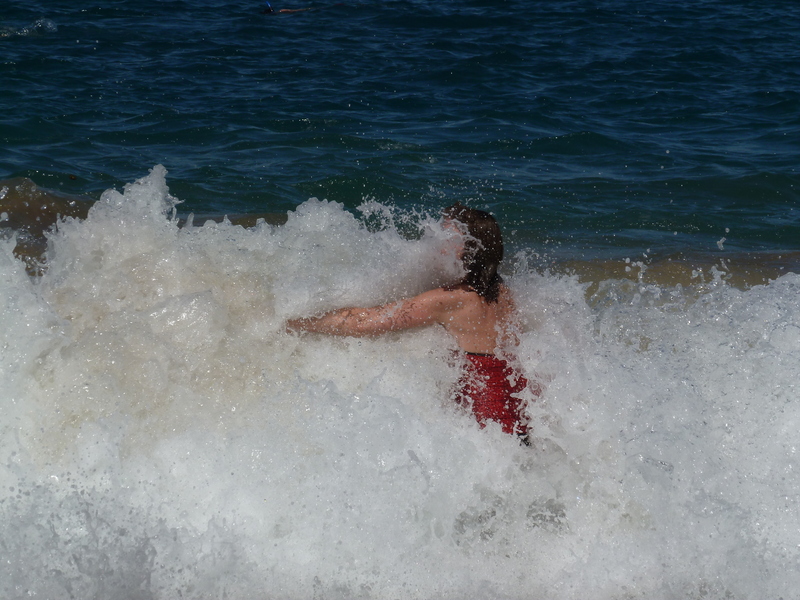 Tomorrow we fly to Maui for the majority of our stay in the islands. We sleep deeply, our room is like a palace to us. ← Good God Almighty…I HATE TAKING OFF!! !